Translation and subs by Sonya L. Revision by Bita J. Recording by Tessa Lande. English translation and subtitles by Sonya Luzina & Julia B. English revising by Katie Anderson. The concert in Riga 18.10.2013. Recording by Ulli Cologne. English translation and subs by Zhanna Sergueeva. English revision by Anni Jowett and Tessa Lande. Romanian translation by Laura Ser. Article published on www.puaro.lv 22.6.2012. In an interview at Puaro.lv Belarusian born, Norwegian musician Alexander Rybak, who three years ago won the Eurovision song contest with the song “Fairytale”, tells the story of his holiday habits, as well as advices on how to spend the weekends. Alexander Rybak is a brilliant musician and a great guy. He caught everyone on the hook without a fishing rod! 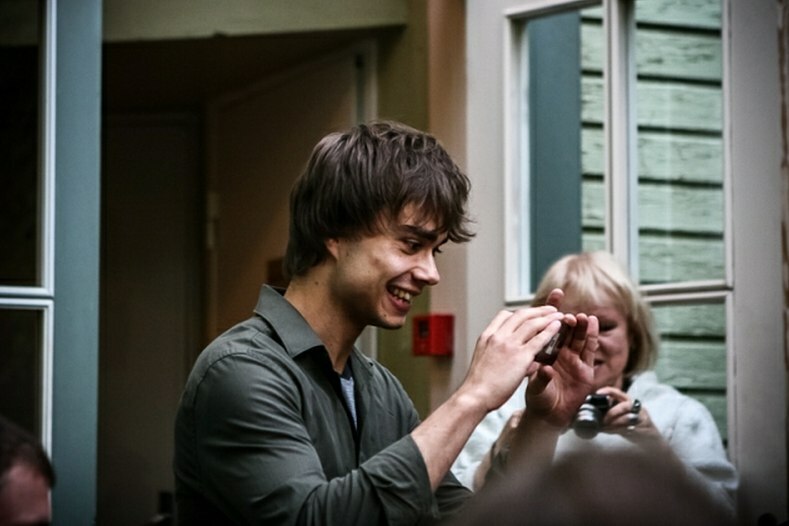 Alexander Rybak meets his fans in Jurmala, Latvia, 19.06.2012. However, even though his victory in the international Eurovision Song was over three years ago, Alexander Rybak by his every step still forces girls to squeal and cry. On Monday evening the singer,with his obvious charisma, came to Yurmala, and next day went on the stage with his dad Igor Rybak and family and childhood friends Michael and Boris Kazinik. The unique tandem of father and son brings a unique musical experience to the Dzintari audience. On June 19th, Alexander Rybak and his father Igor gave the concert “Father and sons” with father and son, Michail and Boris Kazinik at Dzintaru Concert Hall, Jurmala, Latvia. The Latvian TV-News made a report before the concert.